And your mother telling me that she hates me. True story. Your mother really didn’t hate me although part of me thought maybe she really did hate me and I would come home to a knife yielding sleep deprived wife. But in reality she hated the fact that it was her in the situation because of me and I was not able to also deal with it. The moment I got home from work there was no knife, I was safe on that front so I put the side rail back onto the crib for you. That seemed to make all the difference and you were able to sleep. Your mother told me that I was pushing you to grow up to fast. Now that I look back on it, I was. I wanted you to be a big boy faster than you wanted to be one, a lesson I have yet to learn. I want you to be older than you really are and I have no patience. But let’s fast forward to 2 weeks ago. You had started to develop a habit at bedtime that mom and dad were not happy about. You wouldn’t sleep without us in the room. We would read to you each night and let you turn your music on and help us get you ready for bed. The moment we put you in your crib you would cry and cry. The discussion started again, do we put you in a toddler bed? Maybe that is what you want. We didn’t know, you wouldn’t tell us, I mean you were only telling me “Hab A Goo Da” when you would leave for day-care in the morning! 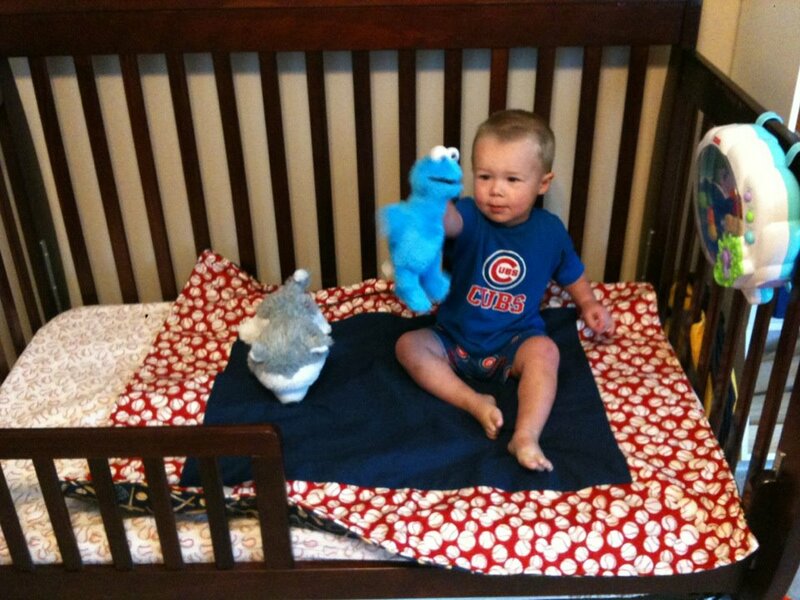 We thought that since you were sleeping on a cot at daycare maybe it would work. We let it go on for a couple of nights and finally gave in and put the toddler rail back on. The same thing as before happened. You would cry and cry. We decided that maybe we could read you to sleep. Well that took 2 hours. There was no way that we could do this each night. I mean we love you son, but two hours? Really? I hope that maybe someday you can explain what you were thinking during this time to me. Your mother was going through law school and needed to study. Me, well I needed my time away from you. I know that sounds mean, but when you are a parent you will understand. It is strange I want to get away from you for a while but I hate it when I am away from you. Strange phenomena that you will understand someday. What happened next though, is the reason you ended up with the Jayhawk in your bed with you. I guess I lucked out with two kids who tended to put themselves to bed. After an hour or two of whining, of course. I’m exhausted just reading that! Mine sleep through the night most of the time, although bedtime is still nerve wracking! No matter how old they get, most of them just don’t want to go to bed. You can tell they are grown up when they want to go to bed on time.